HONG KONG, Tuesday, 20th March 2018 – Today marks the sixth annual International Day of Happiness, a United Nations-backed event aiming to unify all 193 UN member states in making happiness a greater priority across the globe. It’s fitting then, that a study conducted by CSG Hong Kong among a representative sample of the adult population (aged 18 – 55), has revealed that Hong Kong residents are feeling the happiest, as well as the most hopeful and economically optimistic since 2015. 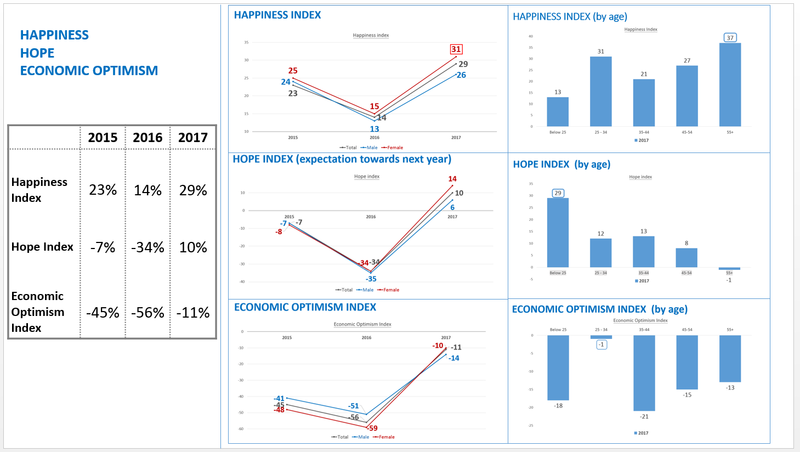 CSG measured a total of 3 different indicators: Happiness, Hope and Economic Optimism in the study. The market research study found that the happiness level among the entire adult population reached its highest point (29%) since 2015 (23%) this year, a recovery from a disappointing 14% in 2016. According to the results, the happiest age group is those aged 55+, with a score of 37%. Interestingly, women proved to be happier than their male counterparts; in fact, they overtook the men across all three indicators. The revelation that women are feeling more positive is perhaps not so surprising given the unprecedented global movement for women’s rights, equality and justice. This momentum is expected to continue, with more attention being paid to the topic across all aspects of everyday life as women feel increasingly more empowered. The research also found that the Hong Kong population is feeling hopeful in 2018. For the first time in three years the hope index is positive (+10%, an increase of +44% points from 2016). It’s today’s youth (those aged under 25) who are feeling more hopeful than any other age group. The economic optimism index has also seen good gains. Although the index is negative (-11%), it’s an improvement of +45% from 2016, when the feeling towards the Hong Kong economy was at -56%. For optimism, those aged 25 – 34 are currently the most optimistic (-1%) about the economy. Hong Kong’s happiness, hope and economic optimism are on upwards trends as Hong Kong has one of the best-performing markets. The Hang Seng Index rose more than 35% in 2017, and the year also saw the index cross the 30,000 mark for the first time since 2007. From Hong Kong TDC, the economy expanded by 3.8% year-on-year in real terms in 2017, after growing by 2.1% in 2016. The Government forecasts that the Hong Kong economy will grow by 3 – 4% in 2018. CSG is one of the leading marketing research firms established in Hong Kong in 1982 offering comprehensive research services to clients in diverse industries and a marketing research pioneer in Greater China. The company has further expanded from providing regional to global marketing research services through connection with the Win/Gallup International network. CSG offer a full range of research methodologies and solutions, including innovative tools like facial coding and eye tracker. Since 2013, CSG became a member of the INTAGE Group which is the leading market research organization in Japan and is ranked 9th largest globally. For more information, please visit https://www.csg-worldwide.com/.